UDM Downloads > Convert DBX File to PST! Users who want to transfer their emails from Outlook Express to Outlook need this DBX to PST Converter tool to move all emails from Outlook Express to MS Outlook PST file. Common users have queries like: How to convert dbx emails to pst emails, How to convert dbx to Outlook 2007, How to transfer emails from Outlook Express to Outlook 2010, How to convert dbx to pst, How to convert multiple dbx files ito Outlook PST files. PCVARE DBX to PST Converter is the stand-alone solution for all queries. 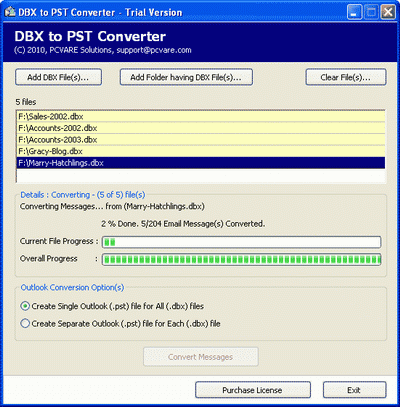 Get the DBX to PST Converter tool and browse dbx files for finally converting them into Outlook PST file format. Software allows you to convert all dbx into single pst file and also allows the users to convert dbx files and save each dbx file as separate pst file. We have also got another DBX file related tools such as Import DBX and Extract DBX. Import DBX allows you to add dbx files back into Outlook Express on new machine or in case of Outlook Express crash and re-installing Outlook Express on same machine. Extract DBX also allows you to convert dbx emails to EML files for further importing into Mac mail or Thunderbird. Get the License of DBX to PST Converter at just $69 and migrate Outlook Express DBX files to PST.